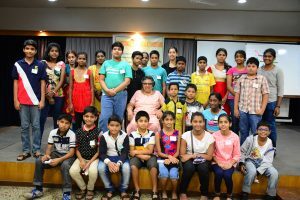 The Navhind Times Planet J’s workshop on scrabble was held on July 31 at Dempo House, Panaji. Designed specifically for those between the ages of 11 and 19, the workshop aimed at introducing newcomers to the game and teaching new techniques to those who already play the unique mind sport. 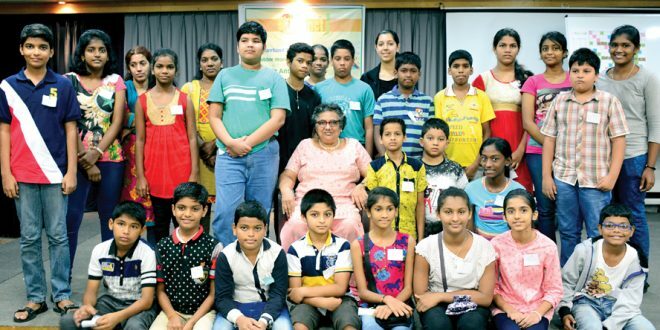 Conducted by Ramola Antao and secretary of Scrabble Association of India, Rajiv Antao, the half-day workshop commenced by dividing sixty two participants, whose ages ranged from ten to nineteen, into groups ensuring there was a judicious mix of all ages within each group. Introduction to the game, its history and benefits was done through a PowerPoint presentation which provided a simple brief to those who had never played the game. “It is a simple word game, but is unique in that it utilises analytical, mathematical as well as vocabulary skills. Most mind games use one or two of these, not all three! 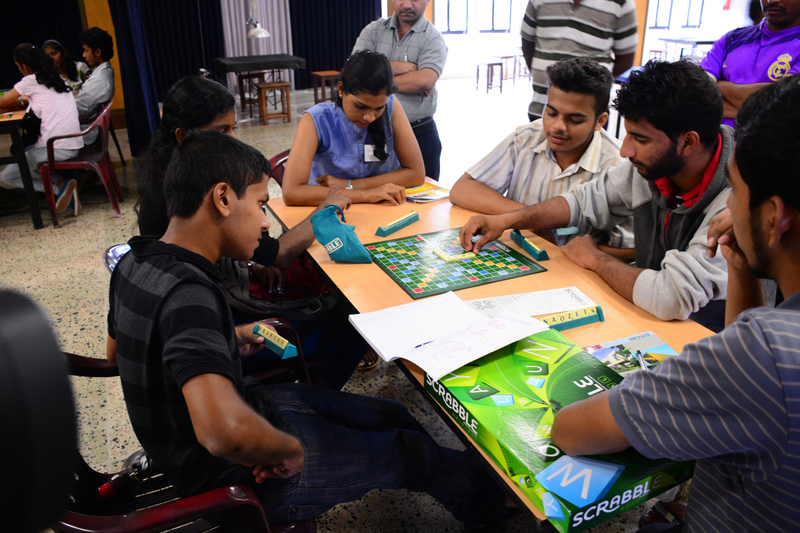 Scrabble is also used all over the world as a method of teaching English,” said Antao. The four quizzes that followed were meticulously planned and checked the general knowledge of participants with regards to the game and its history, yet keeping it easy. Points were given to teams accordingly. The interactive quiz wound up with a comparison of scrabble to life and Antao illustrated the similarity by recounting a personal incident. “Life is like scrabble. You play the letters you draw and do the best you can. Sometimes you get great letters and super places to put them, and other times you are stuck with all the vowels! Sometimes someone even sneaks a non-word onto the board without you noticing. Patience and perseverance are important in scrabble as well as in life,” she said. 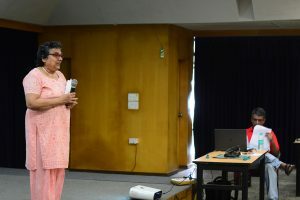 While on the topic of life she then made participants think up words associated with the word ‘dream’ (no one mentioned sleep, their choices were apt – goal, aim, reality, vision, etc.) thus making them exercise their thinking and vocabulary skills. Everyone participated in singing ABBA’s ‘I Have a Dream’, the lyrics of which were given to them. After the break there were word games which utilised anagrams and participants were completely engrossed as they came up with the correct answers along with many misses. The first four top scorers were given specially printed T-shirts. The final session brought out scrabble boards for older children and handmade boards for youngsters who enjoyed themselves by picking up cardboard letters from a bag, making words and sticking them on appropriately. Creativity and fun marked the extremely interactive workshop which ended with Antao handing out certificates of participation. Wow! It was wonderful and I enjoyed every moment of the workshop. I liked the programme and the games. It was an awesome workshop. I enjoyed it. It was very good and I hope Navhind Times organises many more workshops like this. The workshop was very nice. I really had fun and got a lot to learn about scrabble. Thank you. The games were very interesting and I will definitely come again. I enjoyed myself and learned new words as well. The workshop was fun and I enjoyed myself. I enjoyed all the activities in the workshop and they were all interesting. It was fun and I liked it. The workshop was really amazing and I learnt many new words, played games won a prize. I enjoyed myself. Looking forward for many workshops. It was an exciting workshop and I had fun. was a bit long. I didn’t mind though. I liked the workshop and would like to be called for many more. Thank you Navhind Times. I loved the workshop a lot. Thank you Navhind Times. The workshop was just awesome and I learnt many new things about scrabble. Had a wonderful experience and met many new people as well. Thank you Navhind Times. I learnt many new words and that is why I liked the workshop. It was very knowledgeable and I like it very much. I learnt how to make words and score. I enjoyed the workshop. I learnt many new things and how to make words. The game will definitely improve my vocabulary, analytical thinking and mathematical skills. I enjoyed the workshop.